It's hard to believe that we are half way through the June Summer Fun Checklist already! Hopefully, your kids have had a chance to mark off at least a couple of items. Or perhaps they've exceeded the goal of four and are working towards completing the entire checklist by the time the July one is launched. Wherever they are on their Summer of Fun goal, we hope they are enjoying exploring all of the activities and having lots of fun adventures so far. Remember: Once your child completes four items, they can bring their checklist into the following businesses to earn prizes and discounts. If you haven't had a chance to get started yet on the June Summer Fun Checklist, don't worry! There's still plenty of time to finish up before we launch the July Summer Fun Checklist. With fun activities that include listening to live music, watching an Alamo Kids Club movie, snapping a selfie in front of the star at the Bullock Texas State History Museum and cooling down with an agua fresca, you'll be sure to keep those kids from muttering the dreaded, "I'm bored, mom!". Click here to print your June Summer Fun Checklist. Be sure to mark your calendars for our July Summer Fun Checklist Kickoff Party at the Austin Aquarium! 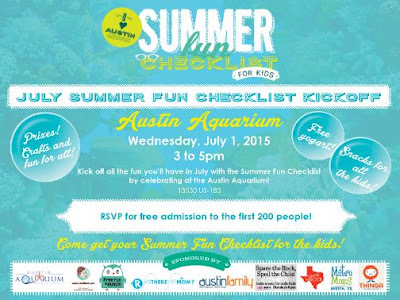 Join us on July 1, 2015, from 3-5 p.m. as we kickoff all the fun that the July Summer Fun Checklist will bring. There will be crafts, free snacks for the kiddos, prizes and swag for the kids. The Austin Aquarium is generously giving away FREE ADMISSION to the first 200 people who register. Tickets will go quickly so don't delay! Once those 200 tickets are taken, the Aquarium is offering 300 additional tickets at 50% OFF!